In late April, the administration at Wilfrid Laurier University announced it will provide additional support for international students from war-torn countries to come study at the university. The news is a big win for the leadership of International Students Overcoming War (ISOW), a student-led group at Laurier which provides full scholarships to international students whose lives have been disrupted by violence in their homeland. ISOW has been advocating for more money since January, when the uncertain political situation in the U.S. made Canada the preferred choice for many international students fleeing war. 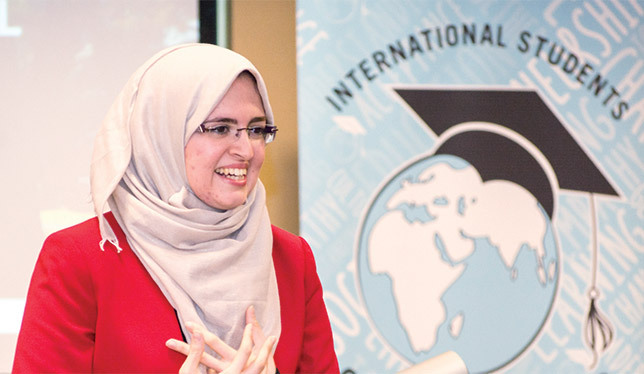 May Mahrat is the recipient of an ISOW scholarship at Wilfrid Laurier University. Money for the scholarships comes from three sources. A student levy raises half the funds, and the rest is split roughly equally by Laurier and partnering non-governmental organizations. The total value of each scholarship is approximately $44,000, covering tuition and living expenses, including money for students to fly home once a year. With the funding increase from Laurier, ISOW will be able to accept six or seven students this fall – three or four undergrads and three master’s students. The group accepted two students in the fall of 2015 and four in 2016. “The way it is being explained is that the university will offset the international student tuition fees in order to allow incoming scholars to pay domestic rates,” said Gavin Brockett, Laurier’s associate dean of arts, student affairs and learning, and the main faculty sponsor for ISOW. The exact amount of this offset varies depending on the faculty but equals roughly $10,000 per year per student. The inspiration for the creation of ISOW was an active learning course on the Israeli-Palestinian conflict taught by Dr. Brockett in 2013. “I had this unusual opportunity to have the students do more than a research paper,” Dr. Brockett explained. “I wanted them to walk in the shoes of the people who live with war.” The students were required to research and analyze global conflicts for their academic learning and then reach out to an NGO as a practical component. The course assignment grew into a student-run organization that was registered in 2014; Laurier’s student body voted in a referendum to approve an eight-dollar levy per student to fund the group. The executive team is now made up of 19 students in charge of everything from accounting to meeting with members of Parliament. At the end of April, they concluded their winter semester with a trip to Ottawa where they presented on ISOW to various members of the federal government. “I never thought of myself as someone who would be interested in not-for-profit work,” says Mr. Beemer. “But most weeks I work more than 20 hours for ISOW.” Dr. Brockett, who is a huge advocate for active learning pedagogy, counts the experience and skills students gain through their work with ISOW for credit. I think this is comendable what you’re doing, though focusing only on the countries “across the pond” leaves behind an entire region much closer to us. The Northern Triangle — or countries in Central America and Mexico — may not be suffering an all-out war between governments, but almost just as bad, they are suffering from the corruption & drugs taking over their daily lives, and disrupting them to such a place that so many are displaced. The 10 most violent countries are in Latin America (http://www.insightcrime.org/news-briefs/ten-countries-highest-child-homicide-rates-all-latam-report), with the most violent cities excluding war also there. El Salvador, Honduras, and Guatemala top many lists. So I am wondering if you can look at these, and in becoming aware of the horrendous plight they suffer, you might be willing to extend your aid to them? It is really great to see agencies and universities coming together to better the students. It is a great start to all the help that is needed for families in war torn countries. Thank you to all the people who devoted their time and effort to this.